This has nothing to do with gender or heritage. Women are often expected to talk more often about failures than men. This case is more about selling a brand and a story that isn’t close to reality, similar to Kim Dotcom. Where we’re often told to choose kindness instead of calling someone out for acting unethically. Journalists built a sensationalised backstory of shoddy guesswork based on a comedy of oversights, which has led to a string of dodgy companies that regularly take advantage of consumers; Threatening customers and other businesses with legal repercussions if they complain publicly, even going as far as to claim to receive death threats when no arrests have been made. I hope this serves as a cautionary tale, especially to journalists who regularly contribute to the credibility crisis in New Zealand media. It is shocking that so many low tier posers get away with selling their daily list of alternative facts and guesswork without a challenge. I have no place in classifying an idea as stolen or bad, that isn’t what this is about. People take business ideas and ruin smaller firms all the time. But the pattern of missteps by the person in question reveals what many from the North Shore have observed for years. Something is not right with this business and people should be able to start speaking out without finding themselves defamed or threatened with a lawsuit. I wouldn’t care if people are faking it and hiding their personal flaws. But using media fame to scapegoat business ethics while continuously scheming people is unacceptable, and the journalists that regularly take part in promoting obvious spruikers have no place writing in the era of “fake news”. 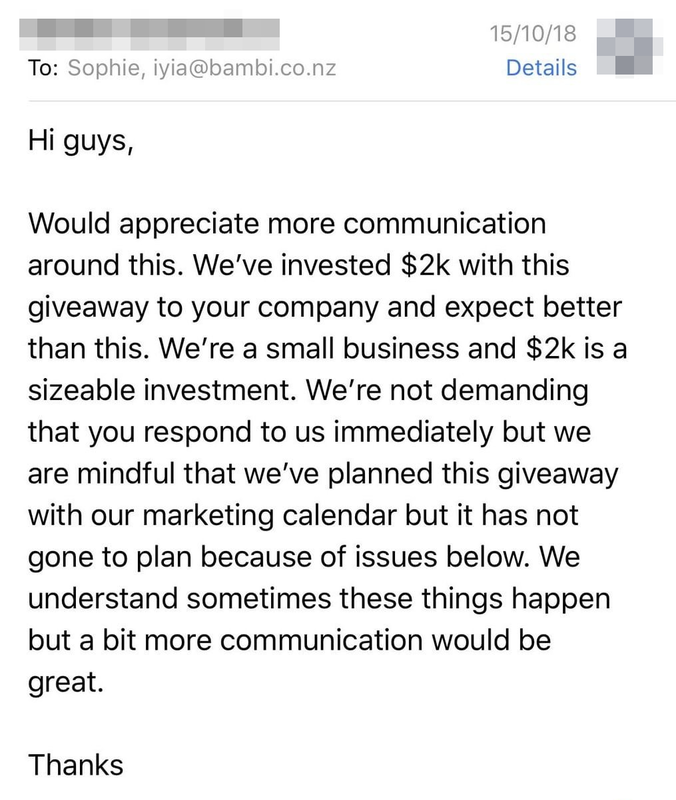 If you’re a regular social media user in New Zealand, it seems that no one is escaping the drama surrounding Celebration Box NZ. Their confectionary boxes have received well deserved negative attention, including a longish rant by Instagram food reviewer, Albert Cho. Celebration Box, based on the company Dessert Boxes in Australia, started in mid-2018. But only after a few weeks, the company had already copped multiple viral social media posts by customers airing out frustrations, not only toward the company but with one of its founders, Iyia Liu. While co-owner, Briar Howard, effectively owns fifty per cent of the company, Iyia has remained the sole antagonist behind the brand’s controversy. Poor quality shipments and non-existent customer service are often cited by hundreds of complaints online. This comes after customers reported not being able to reach the company by email or social media. In response to an influx of negative comment complaints, Celebration Box NZ engaged in deleting and blocking commenters while continuing to feature gleaming photos of sponsored influencers posing as “happy customers.” According to the National Business Review (NBR), Iyia admitted to deleting and blocking customers, citing the need to protect the image of her brands; claiming that all of her unsatisfied customers were refunded. Definitely a few trolls persist in promoting the stories and sh*tposts on both sides of the doughnut debacle, but there are a few worthwhile observations coming out of this drama regardless. It’s a fact that the media wasn’t accurate in their reporting on Celebration Box’s “instafamous” co-owner, Iyia Liu. But despite the commerce commission’s fair trading act investigation and exposed connection to a dubious property scheme, the media’s reaction seems to be keeping her company’s reputation afloat, at least from the outside. Honest reviews remain hard to come by. Instead, prominent celebrities like Max Key and a hoard of micro-influencers regularly post praises about her and the atrocious doughnut boxes, as if nothing is stopping her success. 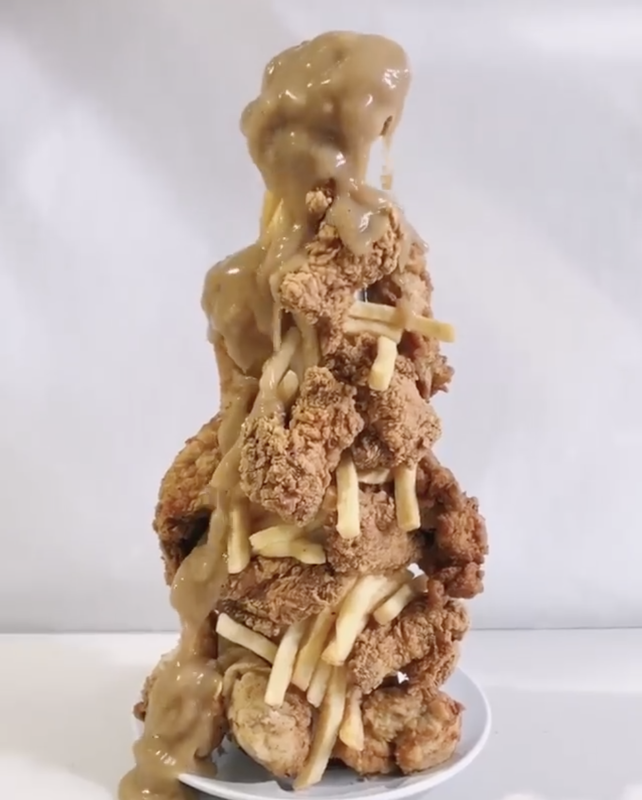 Continually, the company regularly posts memes and jokingly odd giveaways, including a nugget tower and a Macca’s burger box. It looks as if the company is not taking anyone seriously while wondering why people do not like their uncaring approach to running a business. Whenever a mistake is made, customers are reportedly gaslighted and receive constant blame for a comedy of errors that seem to appear more often than not. Multiple customers and critics of Celebration Box have also reported bullying from Ms Liu’s flatmates and friends, including Iyia herself. These complaints often come from customers who posted publicly on Facebook and Twitter about their negative experiences with Celebration Box and Ms Liu. Since the company cannot delete a negative review on a personal page, employees and diehard fans pled negative reviewers to remove posts and to remain positive, claiming that the company’s owners and employees were targets of death threats and hate mail. Famously, after failing to deliver on a reported 2,500 orders for Father’s Day weekend, Iyia Liu decided to unapologetically post a photo of herself on a sponsored beach resort holiday in Bali, asking for customers to empathise. Ms Liu’s empathy post also tagged the venue she was staying at on both Facebook and Instagram. Ironically, Stuff decided to embed her photo directly, inviting more likes (and haters) down the road. Her photo-op did not go down well with customers as the only apology cited by the company at the time came from co-founder, Briar Howard. Over the next weeks, several text messages had flooded social media among private chats and groups showing how Ms Liu had positioned herself and the company as victims of “rude and irrelevant” bullies, threatening to sue anyone that allegedly defames her and her businesses. Incredibly, instead of significantly improving her products, Iyia has been more focused on trying to prove the haters wrong, showing that her business model is working. After doubts about the company’s sales were expressed, Instagram stories started posting the numbers of boxes being shipped regularly, citing anywhere from 200 to 300 boxes a day; In one case, 1000 boxes supposedly shipped out at once for the Christmas holidays. It seems like all smoke and mirrors to point out daily sales numbers in Instagram stories. If the business is doing well, an audit to the media can easily quash speculation. By late November, the saga had shown no signs of letting up. 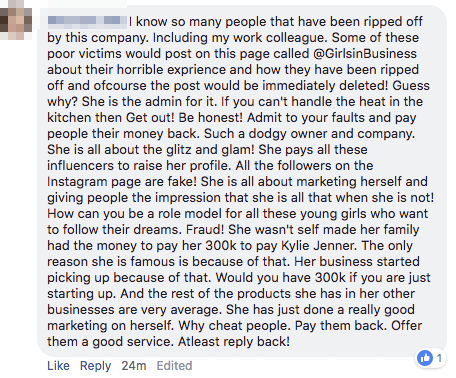 A Facebook and Instagram parody page, aptly named, Celebration Bots NZ cropped up and began reposting deleted comments from disgruntled and ignored customers. On the surface, it’s aimed at trolling Iyia, but it has quietly become a hub to help disgruntled customers resolve their order disputes. Because the page’s URL and display name are similar to Celebration Box (spelled with an I instead of an L), it’s able to capture some complaints and questions meant for the actual company. This was done so that instead of complaints going ignored like before, the parody page can send customers directly to commerce commission investigators. The page has no estimate of how many people have filed a complaint because of their existence, but they have stated most incidents now are late deliveries, missing items, and products sitting stale in courier facilities overnight. The parody page steadily grew in numbers after Instagram suspended the official company’s account, leaving only the parody page searchable. Celebration Bots joyously posted a photo of the Instagram suspension notice and claimed that Celebration Box was flagged for using fake accounts to harass and bullying critics. In response, Celebration Box contended they were trolled by someone filing fraudulent copyright claims against their page, this was later confirmed by an Instagram spokesperson to 1 News. The parody page was taken down for over a week by Facebook due to reports of bullying and harassment, but it was eventually restored. Ms Liu took to Instagram to claim the parody page was being handled by someone cyberbullying her for the last 2–3 months, buying likes for Celebration Box’s accounts, creating false accounts to impersonate her on social media, and sending false information to the press, including people she works with. I was among the people who received a barrage of details about her starting in late September. I will never condone bullying, but I also do not believe that gathering information about a prominent figure could constitute to cyberbullying, especially if they primarily indulge in dodgy business practices and consistently intimidate others who are speaking out. This person communicated their strict conditions of blocking Iyia personally and never sent any message to her for any information, but only encouraged journalists to contact her about public information and complaints regarding her companies. Despite this rule, Iyia had continued “working with the authorities,” including Netsafe, to investigate claims of harassment targeted against her. In response, several cease and desist orders were sent to Iyia by the parody page and suspected trolls, alleging that she was defaming them for criticising her business ethics and how she has been misusing the Harmful Digital Communications Act. The Celebration Bots page persisted in explaining that Netsafe was being used because a frivolous defamation lawsuit would cost Iyia at least $30,000, fees she cannot afford according to them. Ms Liu withdrew her Netsafe complaint within 2 weeks of submission without any clarification and unstated reason. So far, most information the so-called cyberbullies have sent to the media is available in the companies register and is backed up by screenshot copies of comments and emails. Passing on such information, if they’re seemingly volunteered from other people, shouldn’t qualify as sending false information, especially if contact details and relevant sources are invariably included. The first leaks started with a screen capture of a few complaints here and there, but they quickly ascended into a massive cloud folder containing not only information about Celebration Box but every company Iyia has been involved in. Also provided was a dossier concerning Iyia and what is believed to be a set of dubious connections and behaviours that she’s been engaged in, contradictory to the media claims of the last few years. Slowly, these files have been used to publish and retract stories, seemingly on a whim. For Instance, The Herald on Sunday almost featured a top story on Iyia’s “beauty empire,” Girls in Business, only for it to be deleted and retracted entirely. As the story goes, Iyia’s first online clothing business named I’ll Take all Three (ITAT) launched a month after she graduated from The University of Auckland in 2014. According to Iyia, this first venture failed, and she shut it down in just five months. But her next attempts, Waist Trainer, started in mid-2015 and Luxe Fitness in April 2016 helped launch Iyia’s career. Under the same ITAT Limited company registration, Ms Liu sold modern day corsets and protein products using the online platform, Shopify. Shortly after paying Kylie Jenner a sum of $300,000 to endorse her waist trainers, Iyia became a sensational success story for the media, highlighting her $6,000 investment that became a $3.5 million turnover business. There’s less information about Luxe Fitness’ individual success, but Iyia eventually sold both Waist Trainer and Luxe Fitness for an undisclosed amount by early 2017. The financing statement available in the company’s register shows the sale of LUXE was made to Taki Trading Limited in Christchurch, which has family ties to Wine and Tourism Rich Lister, Gilbert Ullrich. The waist trainer products that Iyia became famous for are now being sold under the LUXE brand, suggesting that the two brands were sold in one transaction to the same buyer. The National Business Review erroneously stated that Waist Trainer was sold to West Auckland businesswoman Ruchika Dhingra, who registered an unrelated company with the name Waist Trainer New Zealand Limited in August 2016. Some comments on Reddit allege the sale remains incomplete due to the presence of a creditor financing statement in the companies register, showing Ms Liu as a creditor nearly two years after the reported deal was made in January 2017. According to the National Business Review’s follow up, these claims seem exaggerated as a way to sell her personal consulting and coaching brand as the founder of “several global, multi-million dollar successful businesses from scratch.” Additionally, Iyia’s Instagram is filled with “glamorous” holidays to Bali or the Greek Islands, but each adventure is cluttered in a barrage of sponsored tags of hotels and swimwear, suggesting that most of these photo-worthy trips are paid for by sponsors. 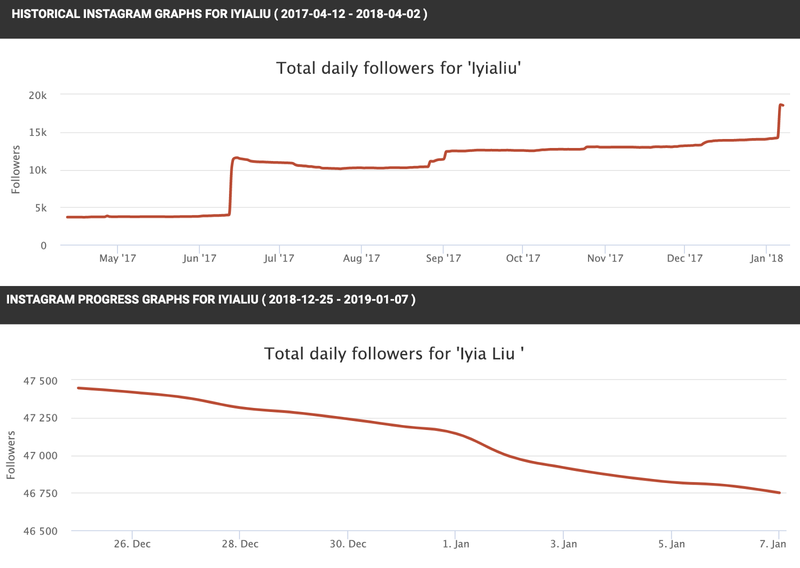 Most suspicious is Iyia’s follower count which only gains followers in 1 to 2-day spikes; it has moved from 3,000 to nearly 70,000 to 46,000 within a year and a half. Her account is still losing over 1000 followers a month which doesn’t seem rational. Maybe this can explain why Celebration Box gained up to 78,000 followers so quickly. Bambi Boutique gained nearly 158,000 followers within 4 days but the number of likes per post remained nearly the same, in-fact engagement percentage went down due to the sheer number of followers obtained practically overnight. For comparison, Max Key’s largest spike of 20k followers took place over a timeframe of one month. Max’s account has grown until stabilising at around 60k followers. There’s a lack of comparisons for Bambi Boutique’s growth because most similar companies (most show steady gradual growth) had obtained a significant following before Instagram allowed sites like socialblade to track followers. To fans, Iyia’s fictive persona as a successful entrepreneur commands respect and attention. To these women, seeing a boss “building a beauty empire” in her twenties and living the luxe life is truly inspiring. Ms Liu is often invited to star-studded events throughout Auckland, mingling with the likes of Jake Millar and Max Key. It’s hard to find a high-profile event at The Herald’s, Spy News, without Ms Liu in a picture or two. Any person with this status, especially a female, is a primary target for harassment and tall poppy syndrome from her counterparts, but the ethics of her businesses, constant over-exaggeration of wealth, and questionable personal investments have made it more apparent that her dissenters have a lot more substance than the average troll. Misleading the media and her followers with the luxe lifestyle seems to have worked in the interim. Iyia’s recently started clothing brand, Bambi Boutique, garnered instant press for hosting an influencer-studded launch. So instead of taking several months of ad campaigns to build a following, she merely sends a press release, and the media will regurgitate her “Kiwi Millionaire” label with a synopsis of her new business of nonrefundable products. Celebration Box seemed to have blown up in popularity due to this tactic, with nearly 6,000 boxes selling within the first couple of months of operation. But with the quality of her products falling flat, more questions arose about how savvy she actually is as a businesswoman. Scepticism regarding the legitimacy of not only Celebration Box but her previous ventures were now starting to come out. 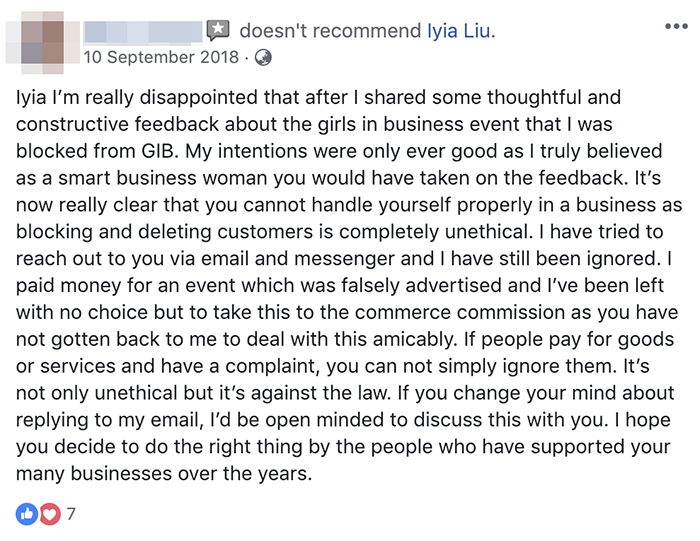 In Iyia’s 50,000 strong Girls in Business group, member comments were reportedly deleted and also blocked for posting critical feedback about her events. Based on several comment complaints, Girls in Business received significant backlash due to speakers not showing up and amenities not being delivered as promised; Members providing seemingly constructive criticism on how to improve the event were immediately blocked and deleted from the group. Girls in Business’ first annual networking event in November, featuring Karen Walker and Suzy Cato, was supposedly better organised, but copped negative criticism from The Spinoff for being too focused on beauty and Instagram influencing, describing the market as substantially saturated. It also seems Iyia’s Bambi Boutique brand is even facing some woes of entering the said saturated market. Despite its massive social media presence of about 196,000 followers (with 0.54% engagement), web analytics reveal significantly less activity for this business, ranking it as New Zealand’s 11,394th most visited website in November 2018. To provide a better perspective of this statistic, Celebration Box took over five months to reach 10,000 orders and ranked as New Zealand’s 4,759th most visited website. Celebration Box is clearly a good idea with market demand, but it’s execution certainly leaves the brand scathed for life. Now that she’s focused on selling her personal brand through Girls in Business and IyiaLiu.com, the example of poor business practices behind her should encourage anyone to question how valuable her advice really is. All influencers are faking it to some extent, that’s what the platform is built on. Two or three decently profitable companies is far from being a failure and should be praised. Deleting comments is illogical unless there’s clear abuse involved. According to a few leaked screenshots, one business owner cited waiting for thousands of dollars in cash and products after waiting for weeks for Iyia to get back to her, within the hour the comment was deleted, and she was blocked. Our supposed proof of this woman getting her money back is hearsay from Celebration Box’s accountant claiming that a refund was made, nothing else. There appears to be a lot more hidden beneath the surface, considering that they’ve lasted for this long with bad press and still seem to garner so many customers and supporters. The dubious connections exposed by the National Business Review are dodgy and sounds like the workings of a Ponzi pyramid scheme that she’s deeply involved in. The exposure was enough to inspire Iyia’s family trust to be removed as a shareholder, as of 18 November, from suspicious investments altogether. According to the Herald, Iyia has referred to learning from her “business-savvy property developer” parents, and that she has never received any financial help from them for her businesses. Some clues to who Iyia’s parents are in countless articles refer to a Beijing born property developers, but never a name. It appears intentional that she wouldn’t name her parents for the record if they are already savvy in the Auckland business scene. 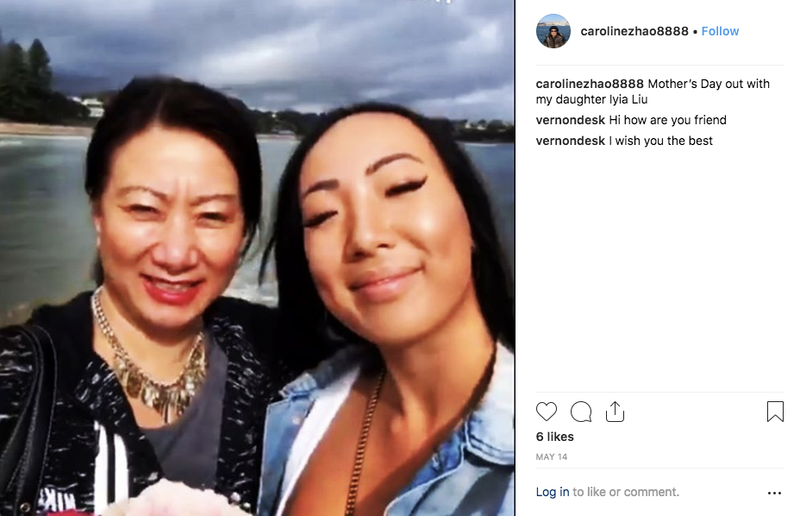 It wasn’t until the National Business Review reported on Celebration Box in late October that the connection between Iyia and her mother, alleged property pyramid-schemer, Caroline Zhao, had surfaced. 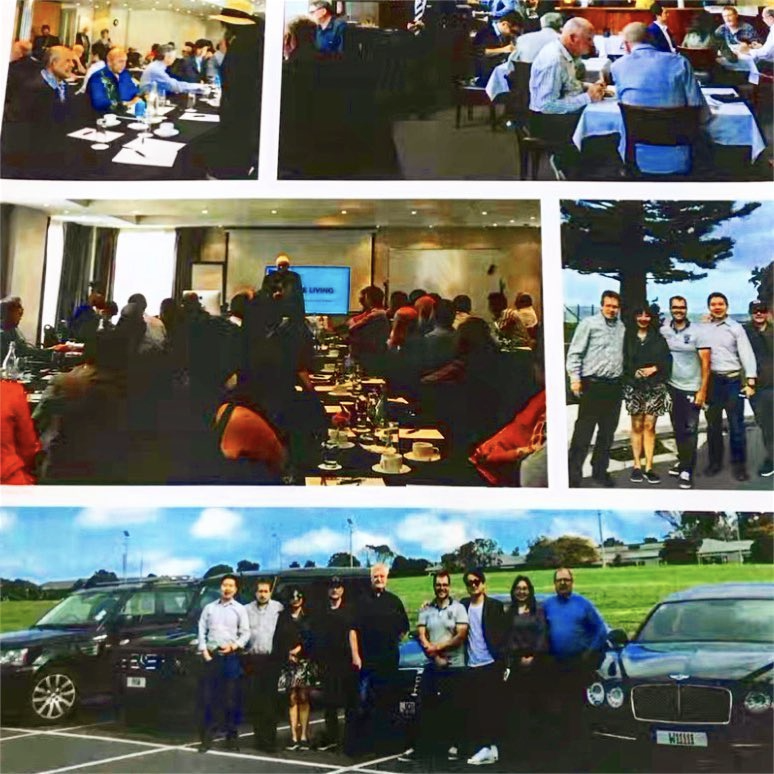 Caroline Zhao, partnered with Dan McEwan (formerly Robert Ewan), run NZ Commercial Services. Through this company, they provide trustee services, directing investments towards property and retail projects. The lot of property trusts are tied to a property scheme they run called Future Living (http://futureliving.global). Dan McEwan has been exposed for running elusive schemes before. He was sentenced in 2009 with Securities Act Charges, after leaving investors out-of-pocket for $100 million worth of mortgages. When it came down to paying reparations, he declared bankruptcy, for which he was automatically discharged in 2012. The gist is for investors to pay a large deposit and in return, the company will build a home on subdivided land at nearly 50% of the cost, minimal GST, promising the home to be debt-free within 10-years. Additionally, investors would receive up to 25% rental yield on the property for their own profit. Other promises include enabling investors to qualify for purchasing a car or a boat as part of the package along with a possible additional $500,000 for a mortgage. Despite Future Living projects being started throughout New Zealand, none of these properties has ever been built. Investors are often fleeced for a partially constructed home and if built at all. In the case of Waiwera Heights Country Club, the project was immediately stopped once Auckland Council found the build plans to be dangerous and unrealistic. Interestingly, almost all of the construction firms involved in the build became insolvent and were eventually struck off the companies office register. How Iyia is connected to this is not farfetched from the fact that she has continually been a director or shareholder of trusts named, K & C Future Living Trustees, New Zealand Asia Trustees, and similarly titled company registrations. Most of these trusts remained in the care of Ms Liu and her sister until the end of 2015 when they vacated their shareholdings. However, a striking majority of these trusts eventually changed names into Future Living, and with Caroline Zhao and Dan McEwan ultimately taking over as directors. These trusts have grown to form a web of companies and trusts that are related to building or supplying Future Living development projects that Iyia is involved in promoting. 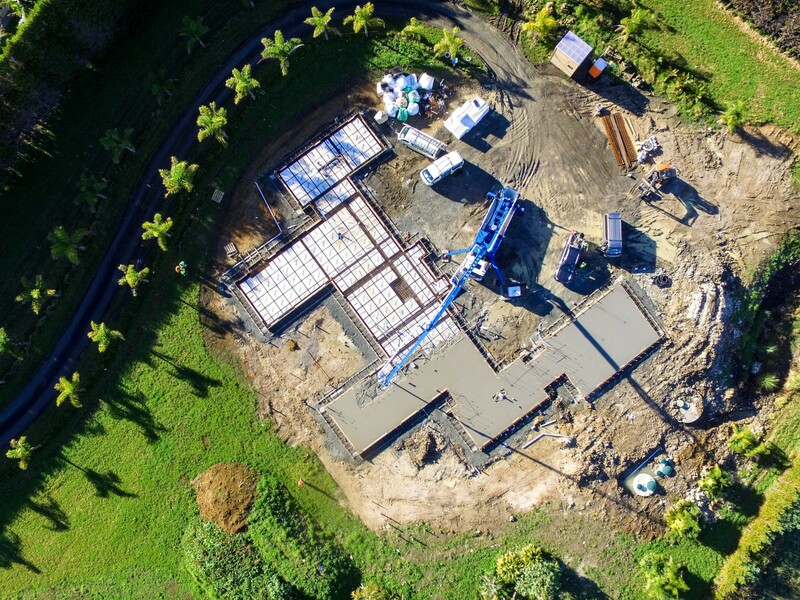 Most importantly, there is a family trust (Iyia Family Trustees Limited) which owns land in Coatesville where Iyia is building a 500m² home to highlight her success in business; It had shareholdings benefiting from one of Future Living’s notorious projects, Waiwera Heights Country Club Limited. After the connections came out, trust shareholdings changed significantly and became even more obfuscated than before. A few suspicious trusts to watch: IDC Business Trustees Limited, DCI Family Trustees Limited (formerly NZ Department Store Limited as of 13 Dec 2018), HID Family Trustees Limited. Above all, I will leave these to the imagination, but all of these Future Living, One Future, and NZ Department Store schemes are tied to these trusts. The only ones close to these trusts also seem to be members of this family. With no subtlety in hiding who the beneficiaries are as all of these trusts are managed by Caroline Zhao. As Dan McEwan has become less involved in the business due to his age, Caroline Zhao has effectively taken over. Shortly after the NBR reported, Dan McEwan was removed from company registrations for good, leaving Caroline Zhao as the sole director of NZ Commercial Services and many underlying companies. On Caroline’s Instagram page, her bio advertises all of future living’s sales points promising high rental yield and a 10 years debt-free home. Also, there are featured photos of Iyia’s ventures up to Celebration Box, showing that she’s keen on what her daughter is doing in business and her interactions with the media. 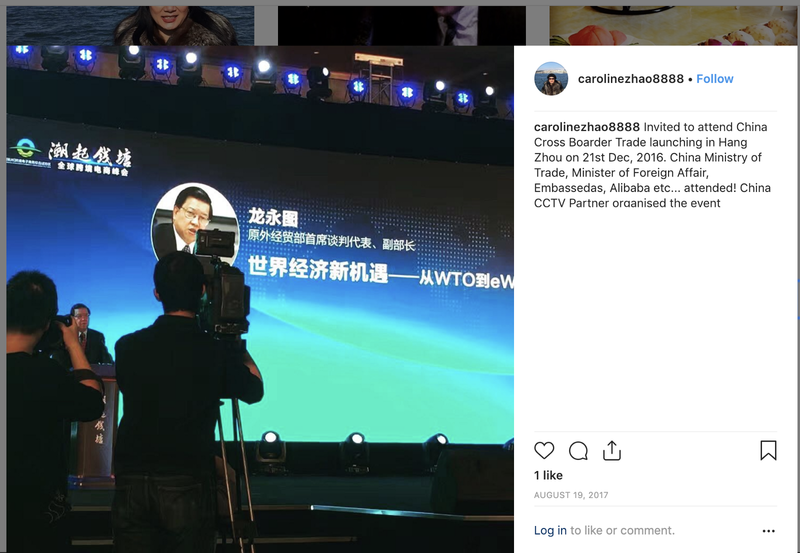 Interestingly, Caroline’s Instagram posts suggest that she is already expanding the Future Living/Global Future brand overseas to the UK and China. Posts about new offices and partners are frequent in Caroline’s timeline. She has even posted about herself sitting nearly front row to China’s Former chief trade negotiator, Long Yongtu, at a 2016 China Global Investment Forum in Hangzhou. Also in attendance, stated by Ms Zhao, were China’s Ministers of Trade and Foreign Affairs. Unsurprisingly, according to Caroline’s social media, this forum also served as a launch for cross-border/belt road announcements. Along with networking at high-level trade events in China, Caroline also seems to have made headway into local politics. Several pictures displayed posing with the likes of Sir John Key and, then Prime Minister, Sir Bill English. The problem is that the National Party has already been caught out accepting unusually large donations from known affiliates of China’s ruling party. 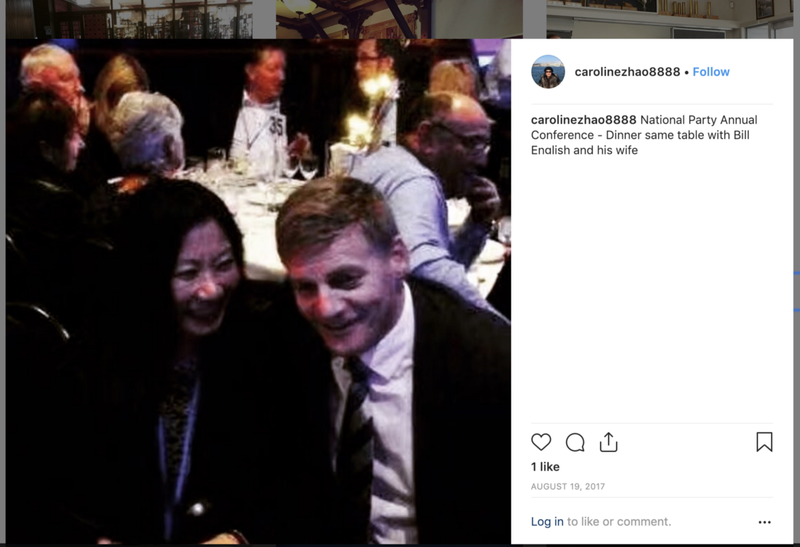 Cozying to a known schemer with cross-border connections is not a good precedent to set for New Zealand politics. Iyia’s branding and reputation took a hit in this latest debacle especially since her tendency is to focus more on what fans say, which has backfired. Waist trainer (sold as a hunger suppression tool) was already controversial, but in light of what is now known, the media handed her borrowed time. She has taken to Instagram many times in an attempt to set the record straight with her fans, albeit through sponsored posts. But it looks like the only ones left buying her story are those also building their own Instagram perfect images. In the end, it all still seems fabricated and inauthentic. It’s a hive mind within the influencer community where beauty and wealth are valued above personal responsibility. With the expensive car and houses, it’s hard to tell how well her companies actually perform since they seem to be performing poorly. Iyia’s saving grace is through her business course students. But how hot they are really doing has yet to be determined by qualified sources (news.com.au and The Herald just doesn’t cut it). Celebration Box has launched its international site, but the brand seems to be tarnished beyond repair. Shortly after hitting 10,000 orders during the Christmas season, the company allegedly has had to raise prices on a number of products due to not covering a lot of their costs. This all begs the question, do all of these businesses serve as a front for the larger scheme at hand? Someone that can supposedly afford to purchase $1.5 million in land and obtain a $3.5 million unused revolving mortgage should be at least $5 million in net worth which doesn’t seem to be the case. Something suggests that there’s a lot more to where this is all coming from because her story still doesn’t add up. UPDATE 15/2/19: LINZ documentation highlighting how the mortgage was likely obtained.